Do please add your Class Association and any useful details of the boat - perhaps numbers in your Class Association - or whether you are simply looking for other owners, and email us at tradboat2017@gmail.com . There is no charge of course. Dinghies and Keelboats see Dinghy/Keelboat. Older Classes, Pilot Cutters etc see our Maritime Heritage pages. Home Page. This page normally has a frame to the left. If you are seeing it without, please click here to explore the whole TradBoat Site and make us its extensive indices. M S Redman designed two very small cruisers, we might call them micro cruisers, for which he sold plans during the sixties and seventies. These were the Barbel 12 and 14 - the 14 was probably the more practical. The boat had a beam of 5ft (1.52m), an attractive sheer, and a small cabin which Redman designed to have room for two full length bunks. Sitting headroom was around 3'4 (1.02m). Sailmark - a Barbel as shown. Whimsically the Barbel II had two barbels (chin whiskers) in the sail mark and of course Barbel I one only. builders sales brochure. The boat was offered with either a Sloop rig or a Ketch rig. Builder: Marine Construction, Ltd. (Marcon), England. Ketch rig: Main/Mizzen/Genoa, 466 sq. ft. (43.1sq. m.). Sloop rig: Main/Genoa, 460 sq. ft. (42.6 sq. m.). The first Corribee designed by Robert Tucker appeared in 1965. (I remember drooling over the first boat at the London Boat Show. It looked so much like a small Folkboat. Ed.) The original wooden design was reproduced in grp by Newbridge Boats of Bridport in the late 60s. Our black & white photograph is taken from an early advertisement placed by Newbridge. Three marques were available finally - spanning the period late 60s to early eighties. Contact the Corribee Association at the email address above. Membership costs £10.00 per year which includes a programme of events, a newsletter, access to technical information in the COA manual and contact with other Corribee owners. Sail area 156 sq ft (14.49sq m) (3/4 standard rig) 175sq ft masthead rig. Berths 4. Construction clinker, originally in wood and later in grp. At this time there was a fashion for Junk rigs probably inspired by Haslar's "Jester". Coromandel was a Corribee under junk rig. Membership of the Association is open to any one interested in boats produced by the Dauntless Company. Currently the Association has about 60 members mostly owning Dauntless Yachts, but the Dauntless production also included sailing dinghies, motor cruisers - and - surprisingly children's paddle boats! Membership costs (at Dec 2009) only £5.00 per year which also includes two issues of Dauntless News. The Dauntless Company was started by "Skipper" Clayton on Canvey Island during the early 30s and moved to Welshpool during the war years where they built mostly small craft including sailing dinghies. They also built a range of specialist boats which included children's 'Paddle Boats, many bought by Billy Butlin for his holiday camps. Dauntless returned to Canvey Island in the latter part of the war where production of the Dauntless sloop started in 1946 with "Ruth". Incidentally "Ruth", a MK1 still going strong. These early boats are recognised by their wider decks. The Mk11 version introduced in the 50s carried the cabin roof out to the sides. 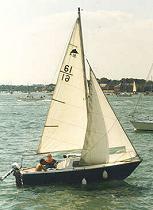 460 boats of this type were built before the introduction of a Mk1l1 version. 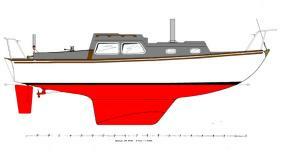 Working drawings are available and new boats may be built to the original specs. Incidentally, the company was still building skiffs and dinghies until it closed in the early 70s. The Dauntless Association is also a home for owners of Sea Kings. The Eventide was designed in 1958 by Maurice Griffiths and is still being built. Plans are available. and to date 2300 sail numbers have been allocated of which there are probably 1000 afloat and a few hundred building. . Eventide is as 24 ft single chine cruising yacht regularly amateur built. There are separate associations for Fairey built sailing craft. The HBA was formed in December 1973 as a result of the effort of Ron Goodhand but with several strands coalescing. Full members are owners, joint owners and past owners of HB designed boats. Associate Members need only have an interest in THB and various facets of his life. Briefly our aims are to locate and keep track of HB boats world-wide; to keep in touch with owners; to exchange and provide information about THB, his work, yacht designs and boats built form them. Two newsletters are provided each year which link the members who are in many countries. They contain THB's designs, articles and letters culled from various sources. There are contributions from members and the President's Letter giving latest news, matters concerning the HBA and miscellaneous items of interest. The newsletters also contain notices of boats for sale, messages from the Treasurer, Editor and others. Two meetings are held each year, the AGM at the President's home (usually in late February or early March) preceded by a pub lunch, and the Laying-Up supper in mid to late September or October, held at a near-water venue. There is no committee, the AGM deals with matters of moment, guests are welcome and may make (useful) suggestions. Click here for more about HBs life, his designs, and useful sources of books and plans. "Laurent Giles: An Evolution in Yacht Design"
Lysander was designed in the sixties by Percy Blandford to appeal to the home builder. Of the many boats built over the last thirty years many are still sailing - and new ones are being built ! The LOA has meetings throughout the year and new members without boats are encouraged to come along - and invariably find themselves sailing. Meetings are held regularly, typically in the Lake Disrict, in the South West, on the South Coast and on the Norfolk Broads. Currently about 250 members. LOA publishes a quarterly newsletter which includes a notice board for advertisements - a splendid way of becoming a Lysander owner. Around 1500 boats built from 4000 sets of plans sold. The boat: LOA 17ft or 19ft. Beam 6ft 8. Draft 2ft 3 Sail Area 125 sq ft. This is a class association concerned with helping owners to look after enjoying the Sailfish 18, 19, 25 and 565, and also the Sandpiper and Seafarer. The association aims to help members keep in contact with each other, and assist with advice on maintenance of their boats. It also provides help and information on obtaining spares. Events are co-ordinated during the early which members can take part and compare experiences. Check out our for sale page if you're looking to purchase a boat or second-hand spares. The magazine is published each year with articles contributed by members, and there are also Spring and Summer newsletters. There is a members' only forum where you can get advice from other Sailfish owners. If you are if you have just bought or are thinking of buying a Sailfish, or Sandpiper, sailing boat you should think about joining the Sailfish Association. You get to know more about using and looking after your boat and finding replacement parts you may need. You would join our friendly group of Sailfish owners. 141 Seadogs are listed by the Association, of which about 130 are members. Somewhere there are numbers 101, 115 and 126, and the Association would be delighted to know more about Sundog, Diadem, and Dogstar. LOA 4.95m/16'3. Beam 1.91m/6'3. Draft plate down 1.08m/3'6 1/2' - plate up 0.29m/11 1/2'. Sail Area main & jib 9.7 sq m/104sq ft. Genoa 4.3 sq m/46sq ft. Weight approx 410kg/900lb. 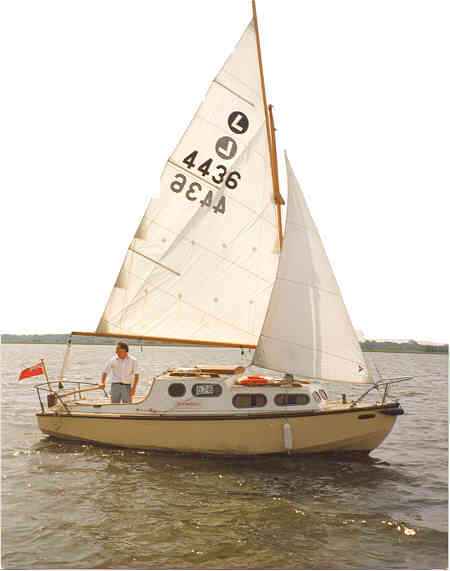 Ray Kaufman USA designed this attractive MORC sailing cruiser in 1960. 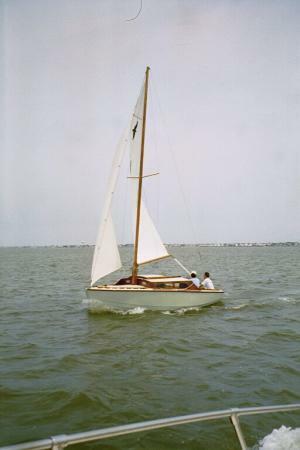 Throughout the sixties and seventies many were built in the USA , the UK and probably elsewhere, and there were several minor variations, viz fin keel or bilge keels, and skeg or transom mounted rudders. Later UK models built by Gilmax Ltd became a Mark 2 version, known as a Signet Super 20. Engines could be inboard or outboard, mostly the latter, of between 4 and 9 hp. References: Reviews that appeared in Practical Boat Owner January 1976 and in Yachting Monthly May 1976 can be obtained from the publishers on 01202 440832, or email at copyreport@ipcmedia.com or www.ybw.com/reprints. An interesting description of the restoration of “Rigel” sail no. 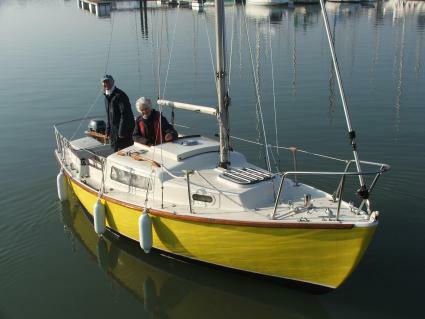 138 can be accessed at www.graybyrd.com-Sailing-Rigel/Rigel.html where a very full specification of the boat is also posted. 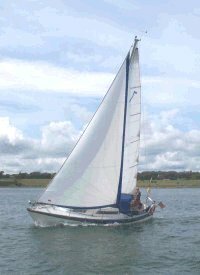 A Yahoo Group was formed in January 2004 by Mick Mixey, and currently has 23 members, many of whom own and sail a Signet 20. The Group welcomes visitors at www.groups.yahoo.com/group/signjet20 and anyone interested can become a member, and join in the ongoing discussions and reports. 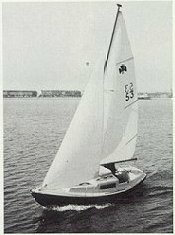 Silhouette Mk1: 16'0 (4.92m) loa in plywood, (designed to come out of two eight by five sheets), only a handful , home built as intended. Did not have the wavey sheer characteristic of the later boats. Silhouette MkIV: 15 boats fitted out by another company with two 1/4 berths and no forward window. In effect a modified MkIII. Gel coat in pale green - slightly confusing because some of the MkIIIs were also in this colour. Membership. The association organises a rally and puts out regular newsletters. Membership is not confined to Silhouette owners. Details on the website. Tel and Fax: (01702) 523540. The Boats. The Association has about 300 members (March 2007) who between them own Snapdragons, Mirages and Invaders, all originally built by Thames Marine at Canvey Island. Snapdragon 600. 21, 670, 23, 747, 24, 26, 27, 890, 29 . Technical. A journal is published by the Association bi-annually containing technical information and articles submitted by members. A technical information service is available free to members only, providing reprints of rigging, sail and hull plans for the majority of classes. Every member is presented with a register of subscribing members detailing boat name, sail number, sailing area and telephone number to enable members to get in touch with each other about technical problems. The register is updated twice a year. Membership The Association has Thames Estuary, Medway and East coast rallies, meetings in early Autumn, and Spring and Summer cruises. Membership extends currently as far as Australia, Sweden, Canada, and the USA. To become a member a £10 registration fee is charged and the annual subscription is £10 (paid by standing order). For more information please use any of the contacts above. The first Stellas were built in 1959 to a design by C R Holman, and the last in 1972. The majority were built by Tucker Brown at Burnham but a number were also built by Petticrows and others. 110 Stellas were registered, of which 6 were not built and four are known to have been destroyed. Of the remainder, 76 have been traced, most of which belong to the Association. So, out there somewhere there are 24 more Stellas of which we would be delighted to have news. Details of the Association from Tony at the address above. Displacement 5066 lbs. Sail areas: main 137 sq ft. Working jib 150 sqft. Trident was designed by Alan F Hill and built by Marcon Marine between 1968 and 1974. This association is for owners of the 24 foot Trident sloop and currently has about 130 members and about 104 boats. 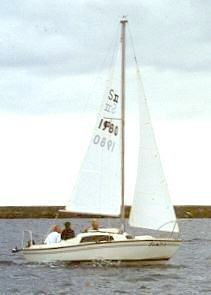 Trident's were offered for build / sale in three versions to cover local sailing and mooring conditions. 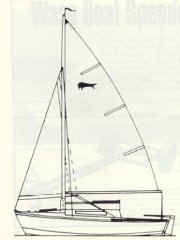 There was a Fin Keel, drawing 3'8'', Triple Keel, drawing 2' 6" and a C/B drawing a minimum of 2' 1" ; the mast being in a tabernacle for those who had to contend with bridges / obstructions. The association runs a public web site, and a members access only Email site under the 'Yahoo Group' system. Both Web and Email sites are undergoing development. Full membership of the 'Trident Owners Association' is conditional on owning a Trident Yacht with Associate membership open to previous owners. Designed by Per Brohall, these 27ft boats were built by Albin of Sweden. They were introduced in 1966, and production ceased in 1978. There are around 3500 boats sailing worldwide - about 2500 of them belonging to one of seven Vega clubs, of which the UK Club has around 200 members. Twelve Vegas have completed circum-navigations, the last one single handed. Technical advice - talk to Steve Birch (Treasurer) on (01684) 568676 (8 Cockshot Road, Gt Malvern, Worcs WR14 2TT) - or email him at steve@albinvega.com VAGB make their own spares for members. Plans are available from the Vega One Design Association or VAGB.